We all know Piccadilly products are amazing for everyday personal use but you might not be aware that Piccadilly offers an assortment of promotional products that are great for businesses. Promotional products are an asset to any business marketing strategy, they are an excellent way to make a solid impression with potential clients and they’re an easy way to create new leads for your business. 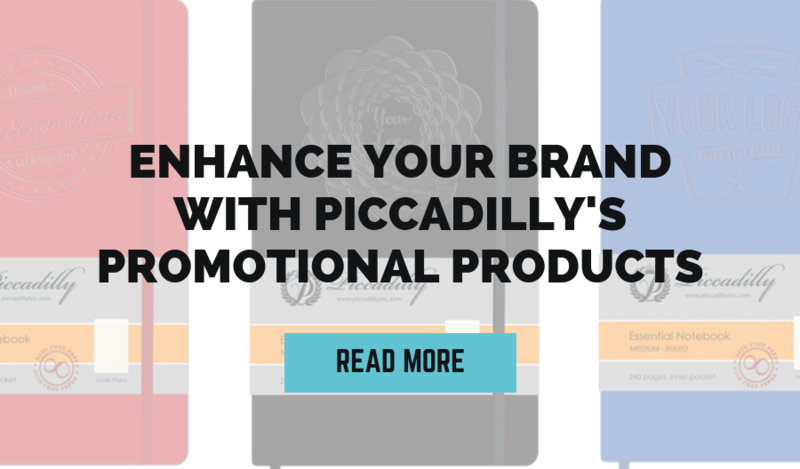 If you’ve been wanting to add promotional products to your business there are many reasons why Piccadilly should be your go-to for promotional business products. When it comes to promotional products, quality cannot be understated. Providing clients and potential customers with sub-par products is a good way to throw money away as they might end up in the trash! You want to provide clients with quality products that they’ll want to use on a regular basis. Ultimately this is the end goal for promotional products, getting your business name out there for others to see. With Piccadilly, quality is a top priority. Piccadilly’s promotional products are made to withstand the test of time with acid-free paper that won’t yellow or crumble with age. Soy-based ink products also take the cake when it comes to longevity and Piccadilly pens are designed to stay bright and fresh with each use. These options allow your business to showcase its creative side and Piccadilly offers further customizations and graphic design services if needed. When it comes to the environment, every effort can help make a difference. Piccadilly prides itself with providing a high-quality product that’s environmentally friendly. Piccadilly’s journals and notebooks are made with “wood free” paper which is made from chemical pulp fibers. Soy-based inks are also easier on the environment than traditional petroleum-based ink pens. By choosing Piccadilly for your promotional products you’ll gain the peace of mind that comes along with doing your part to help the environment. Beyond promotional marketing products, Piccadilly journals and notebooks are a great addition for your own in-house business needs. Get your teams creativity flowing by using journals and notebooks as a sketching and brainstorming tool. Sometimes it’s necessary to step away from the computer in order to bring out new ideas and it’s a known fact that sketching and free writing have an innate ability to foster creative new ideas.